The campaign, which launches globally on 17 January 2019, shows how flying with Qatar Airways transforms the entire experience of travel - and turns the familiar into something truly magical. Everything that Qatar Airways passengers see and do becomes an experience like never before. The centrepiece of the new global campaign is a charming and visually stunning film portraying one family’s journey with Qatar Airways. The fairy-tale voyage takes them from their flight through to the romantic streets of Paris, to the vibrant ice-rink and parades of New York City, the hustle and bustle of Hong Kong, the comfort and serenity of the airline's A380 lounge and the compelling mix of tradition and modernity of Doha - before the family finally return to their QSuite flat-bed - and then drift off to sleep in award-winning comfort. 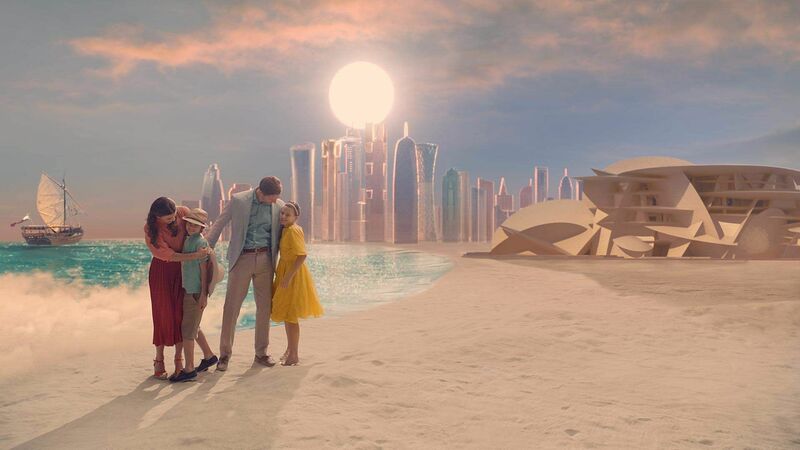 Qatar Airways’ vision is brought to life in a truly cinematic way. Filmed on the biggest green screen in Europe by an incredible pool of talent, including a production crew of more than 200 people across four continents, as well as using a real ice rink and incredible detailed, handmade props. Post-production was handled by MPC in Amsterdam and London. MPC were behind the incredible after effects of films such as The Greatest Showman, The Jungle Book and this year's The Lion King.